On September 11 at the General Assembly of the Presbyterian Church of Korea (PCK Tonghap), held at Iri Shinkwang Church (Rev. Jang Deok-sun), the delegates did not accept the report by the Constitution Committee stating that amendment of the Ban on Hereditary Succession (PCK Tonghap Constitution Article 28 Section 6) is necessary because it violates basic rights. 1,360 delegates voted, with 511 yeas and 849 nays. 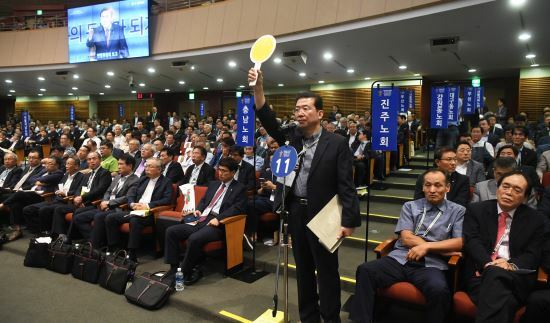 Ahead of the Trial Department's report on September 12 regarding Myungsung Church’s pastoral succession, the delegates clearly expressed their opinion that hereditary succession is wrong. *In the photob a PCK Tonghap delegate states his opinion on whether or not to pass the Constitution Committee’s report that the Ban on Hereditary Succession is inadequate.